Be sure to put a note on your calendar for tonight 7:00PM. You need to be fully informed before you vote on this Referendum Issue. The Green Light Pinellas Marketing machine is in full swing this meeting is your chance to hear firsthand the other side of the Pinellas County Sales Tax Referendum. You can read the actual ordinance you will be approving here: Greenlight Pinellas Tax Ordinance. See if you can find in this Ordinance the kind of controls, limits or protections you would expect when a taxing authority wants to take $130 million of your dollars out of the local economy. There is absolutely nothing wrong with public financing of public transportation but in this Ordinance the Pinellas County Commission opens your wallet, invites PSTA in and walks away. 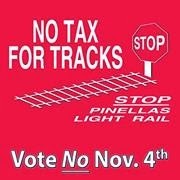 There is a right way to provide for public transportation but Green Light Pinellas is not the way.